EIA Archives - Solar Love! Home Tags Posts tagged with "EIA"
New figures from the US Energy Information Administration show that renewable electricity generation is surpassing levels from previous years in every month of 2016 so far, which comes as no surprise given that renewable energy dominated. This is not only good news for the renewable energy industry in the US as a whole, but also specifically for the large-scale hydro sector, which had suffered a lengthy drought across the US West Coast. Hydro generation has increased, and has now returned closer to historical levels. Meanwhile, non-hydro renewable generation also continues to increase year over year, and exceeded hydro generation in each month since February of this year. This comes on the heels of massive renewable power capacity growth, with renewables accounting for 69% of new US electricity capacity in 2015 and 43% of new US electricity capacity in the first half (H1) of 2016. The figures from the EIA represent both conventional large-scale hydro, as well as non-hydro sources such as wind, geothermal, biomass, and solar, and are restricted to utility-scale projects whose capacity exceeds 1 MW, as well as estimates for distributed solar PV generation. The hydro sector had suffered dramatically from drought, reaching its lowest level in 2015 since 2007, primarily due to drought conditions in the Pacific Coast states — a sizeable issue, considering that California, Oregon, and Washington together contain 50% of US conventional hydro capacity. We have seen non-hydro generation increasing steadily over the last few years, and in March of this year, it collectively exceeded 10% of the monthly electricity generation mix for the first time — repeating that achievement again in April. 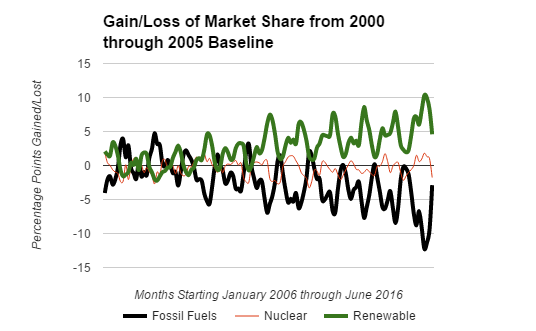 Unsurprisingly, and as we have seen repeatedly in other reports, capacity additions for non-hydro renewables have collectively accounted for most of the electric capacity additions made over the past three years in the US from renewables, thanks in part to the declines in capital costs for wind and solar. Coal electricity has fallen from 34% of electricity generation in H1 2015 to 28% in H1 2016, on the back of numerous coal power plant retirements. Utility-scale solar photovoltaic power plants are now generating about twice as much electricity as they did just one year ago in the US. 12,303 Gwh were sent to the U.S. grid by utility-scale solar in 2014 through the month of September. For the same period in 2013, that number was 6,048 GWh. The larger figure is only about 0.4 percent of the total amount of America’s electricity, though about 1.5 million US homes could be powered with the 12,303 GWh. 1.5 million homes might not sound like much, but let’s say each home has two people living in it, on average. Then that would be solar power for three million people. The population of Rhode Island is only about one million. Delaware is less than one million, and Vermont is a little over 600,000. If three American states were entirely powered by utility-scale solar, do you think no one would know about it? Of course, not all of the 1.5 million homes are located in those three states. They are all over the nation, and especially in California, but the point is still clear: There is enough electricity generated by utility-scale solar to power them. Did you hear that the amount of electricity produced by utility-scale solar had doubled in one year? Is the national mainstream media covering these achievements by the solar power industry?